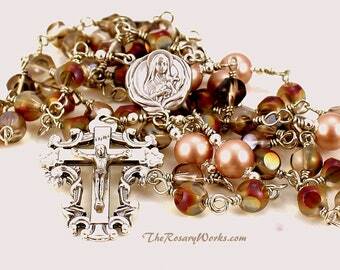 The Ave beads in this rosary are pale pink 5.5mm Bohemian picasso beads. These beads from Czechoslovakia have a delicate pink picasso coating over a white bead. The 12mm handmade lampwork Pater beads are the perfect compliment to the Ave beads. They feature a black background with pink roses and green leaves encased in clear crystal. The center is an ornate Miraculous Medal. The Indulgence crucifix has the Sacred Heart of Jesus on the reverse side along with the statement: "Behold this heart which has so loved men. Father Forgive Them" Both the center and the crucifix are silver colored metal. The wire is solid German Silver wire which is lead free nickle silver. This silver may tarnish over time if not used regularly. If that happens, if can be polished with a Sunshine Cloth. However, the surface color of the wire can not be worn off because it is solid German Silver. NOTE: I take my photos with a macro (close-up) lens. The beads may be smaller in real life than they appear to be in the photo. Please read the description for accurate measurements and sizes of the beads. ABOUT UNBREAKABLE ROSARIES: Dainty and durable are adjectives that are seldom used to describe the same thing. 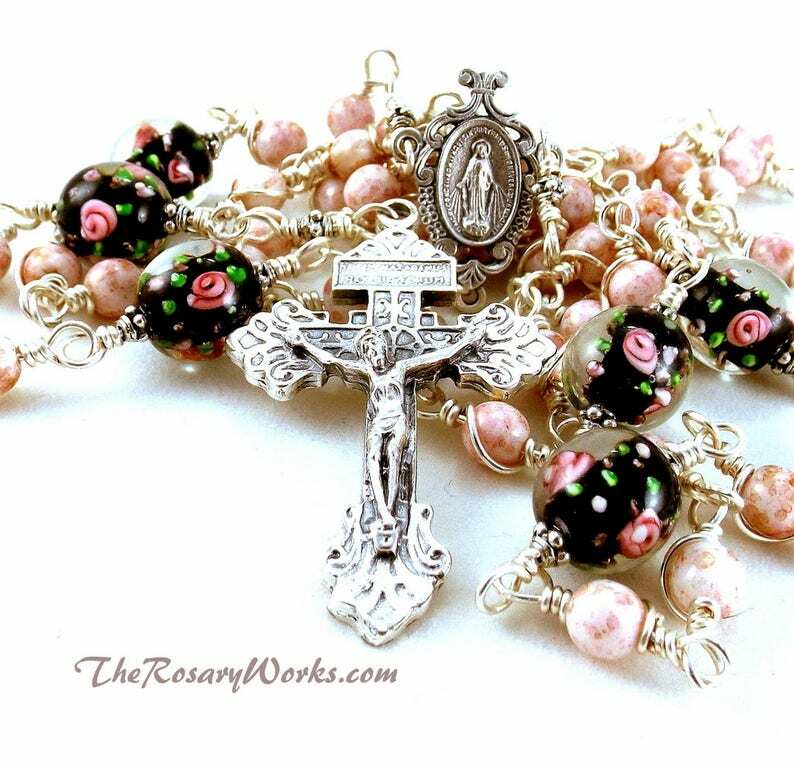 However, this unbreakable rosary is both dainty and durable. The tarnish resistant, silver plated wire is coiled 2 1/2 times at either end of each bead. Because of this, it is impossible to break this rosary with normal wear and prayer. It is designed to be your prayer partner for many years. GUARANTEE: I am so confident in the construction (wire part) of this rosary that I will be happy to repair it for free if it should break with normal wear and prayer. However, I can only guarantee the construction of this rosary. ALSO NOTE: This rosary was meant to be used as a vehicle for prayer and was not meant to be worn as a necklace. I stand by my workmanship when the rosary is used as it was intended, but can not guarantee it if it has been worn as a necklace. I love, love this rosary. I was looking all over the web for one, and had a different one in my cart. Then I came across this one, and my heart knew it was just the one I was looking for! It is beautiful! This a a beautiful Rosary, I gave to my Mother for Christmas, she loved it. I was tempted to keep it for myself!